Last year at a wedding shower, I received a sweet little aloe in a little round pot. Today, I re-planted it and its four babies. “Where there is love, there is life. –Mahatma Gandhi,” said that little tag attached to it. My how love has grown! May it always be so. May love find a way. Blessings to Hugo and Philip. May their love be a blessing to others. 1. A whole flock of turkeys in the field across from Flinchbaugh’s this morning. 2. Bees in the windflowers and crocus. 3. The blue eye of speedwells all across the lawn. 4. Bluebirds murmuring around the hollow. 5. Phoebe looking for a place to nest. 6. Hot tea with milk and honey. 8. The scent of spring rain: petrichor is the word I’ve heard for it. 11. The Book Fairy has struck again! The children have half a new bookshelf of new things to read. I went through a period of time when, instead of gluing down the pieces of a collage, I would just set them together, and then photograph them. I carried with me a little box of collage elements for months, arranging and rearranging them. I don’t know if this was a good and interesting artistic process or a symbol of something in my brain that was unwilling to commit to permanence. Still, some of the photos that I took then continue to grab at strands in my unconscious, like this one. 1. The way crocus refuse to stay within their borders. While I do believe in good, strong, safe boundaries, I do think that those crocus escaping out over the lawn have a special message. 4. The poem that is beginning to form. 5. How language shapes and creates ideas. How ideas hinge on the language used to express them. 1. That green Cholula hot sauce–poblano and jalapeno–that Jon bought yesterday. At the risk of sounding like a food snob: It was revelatory. 3. The little elves in the house who got up at 6:15 to start making birthday preparations for their dad. 4. Jon Weaver-Kreider–I don’t mention him here very often because I don’t want to intrude on his privacy by throwing him into my public spheres, but he could be on every gratitude list I make. 5. Loreena McKennitt–I haven’t listened to her in a long time, but a photograph this week sparked a memory of her music, and I am rediscovering her. 1. Friday morning hymn sing with my colleagues. 2. Blue, blue, blue, sky blue as Mary’s robe. 3. The way humor can sometimes make the bleak and difficult breathable. 4. My colleague Amanda, who helped me out of my February Funk yesterday by reminding me that February is the time to be actively seeking the minute indications that the season is progressing. 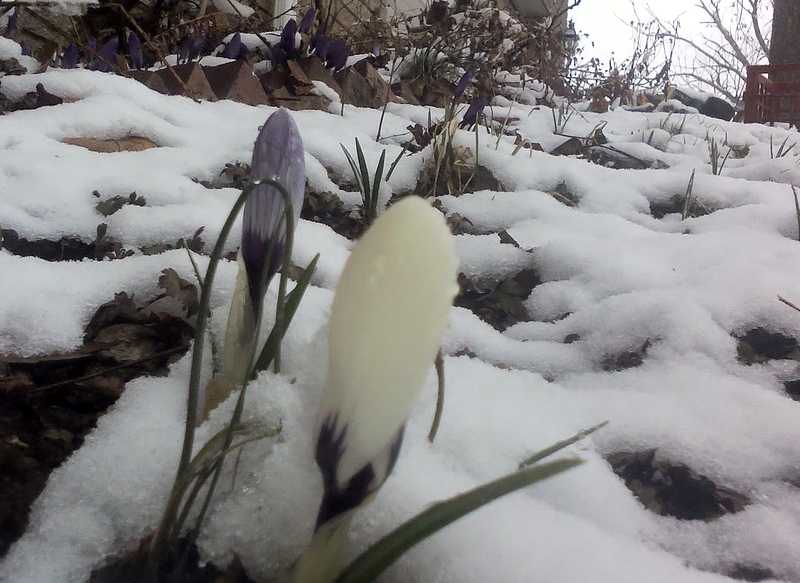 I came home and found one crocus bud and one aconite bud. 5. The tiny wing-person with the huge voice who is singing songs of spring. Not a particularly clear photo of the white crocus in the snow. Among the masses of deep purple and bright violet crocus is one golden crocus who was completely covered by the snow, and this lovely white one, camouflaged in the snow. 2. Crow in the snow. There is some inward thrill I can’t quite name about those black wings flying through a field of dancing white flakes. Also, I love seeing black wings against a field of golden corn stubble. Black wings against a blue sky. Black wings through misty air. 3. Yesterday’s conversations, Part A: For my opening moments in class yesterday, I followed the lead of another teacher friend and showed a video about a high school student who was disturbed by the unkindness of tweets between students in his school. 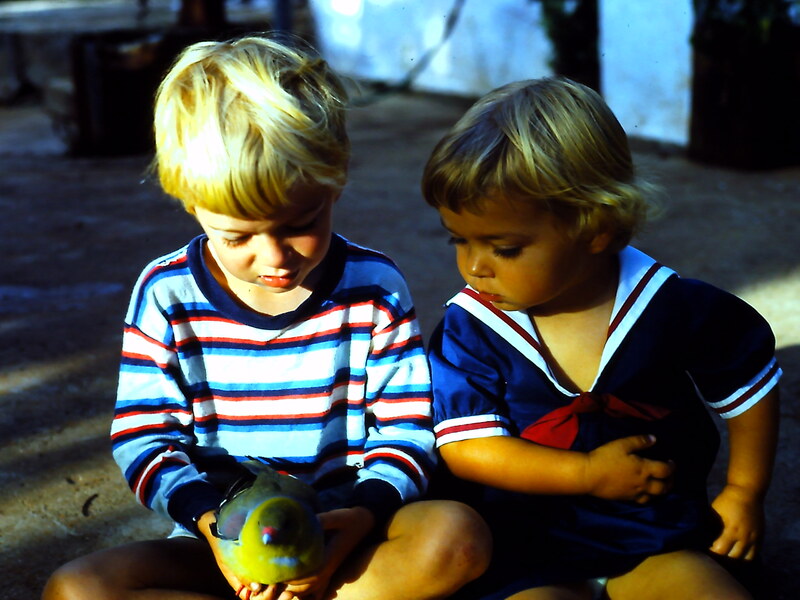 He began a Twitter account in which he began tweeting sincere and heartfelt compliments about his friends. People began talking about it, and it began to snowball. I was afraid my students might be cynical, and the one class that I was most concerned about began talking about it in a slightly cynical vein, and then suddenly they were sharing about the things that hurt them, the ways they respond to unkindness, the ways they try to include each other. We didn’t really get to my actual lesson for the day, but I am pretty certain that learned more in that spontaneous, student-generated conversation than anything I could have offered them. I need to keep remembering that once in a while the best thing a teacher can to is just get out of the way. Language Arts is about expanding the communication skills of students–so I consider that class a success on the academic as well as the psycho-social level. 4. Yesterday’s conversations, Part B: I ended up getting home much later than I had planned to because a Chinese student stopped by after school to talk about how to improve his English grammar. We went through his most recent paper in detail, and talked about how to make his sentences flow. While we were working on the paper, we also talked about imperialism: Japanese imperialism in China at the time of World War II, and Roman imperialism at the time of the Caesars. I love being back in the world of academia and watching my students beginning to piece together their ideas and learning. 5. As I typed that last, I had a sudden vision in my head of my grad school professor, Dr. Zancu, who would set up a discussion, then sit back and smile and nod serenely at us as we went at it. I feel myself in the stream of the many good teachers I have had in my life: my mother who was my Kindergarten teacher; Miss Guntz, my fifth grade teacher at Locust Grove Elementary, and my other teachers there; my teachers at LMH; professors at EMU and Millersville and Sunbridge College; Sarah Preston, who has taught me so much about putting my roots into earth and my branches among the stars. I am incredibly grateful for my teachers. I feel a convergence, as though all those streams of learning are meeting now. 6. Since those last few were several parts of one theme, I am going to give myself a bonus gratitude this morning: Rising to the occasion. I have gotten used to saying, “That’s not in my skill set.” And that’s great protection–it has served me well and kept me from getting too caught up in too many things that I can’t quite manage. But there also comes a time when it seems right to say, “I am ready to grow in that area and develop those skills.” Scary stuff, that. I am going to take on the symbol of the mountain lion for a while, to help me focus on the inner growth that I want to develop. 1. That fog last night, how it swirled around the lamps on the bridge, how it turned the lamplight into a living, swirling thing. 2. Yellow aconite. Violet crocus. The boys say they have seen the bees. 3. Friends of Shirati banquet last night. Old friends. Lifelong connections. 4. Daryl Snider’s concert at the banquet, how every song seemed to be perfectly designed for the moment. Here is one of the songs he sang last night, “Nou se Wozo,” about resilience. This performance was from last fall when Sopa Sol (the singing duo of Daryl Snider and Frances Crowhill Miller) sang it with LMH’s Campus Chorale.